We’ve had some glorious days filled with flowers. Now the goal is to keep them looking their best. A little snip here and there goes a long way. I like to step outside in the morning with my cup of coffee and a scissors or pruners. For some perennials it means cutting back the spent flowers to an intersection on the stem near the mass of leaves and waiting for next year’s blooms. For other perennials, cutting back encourages a second bloom. While for others, like Calamintha and Penstemon, leaving them alone is best. The seed pods will look nice and often feed the birds. 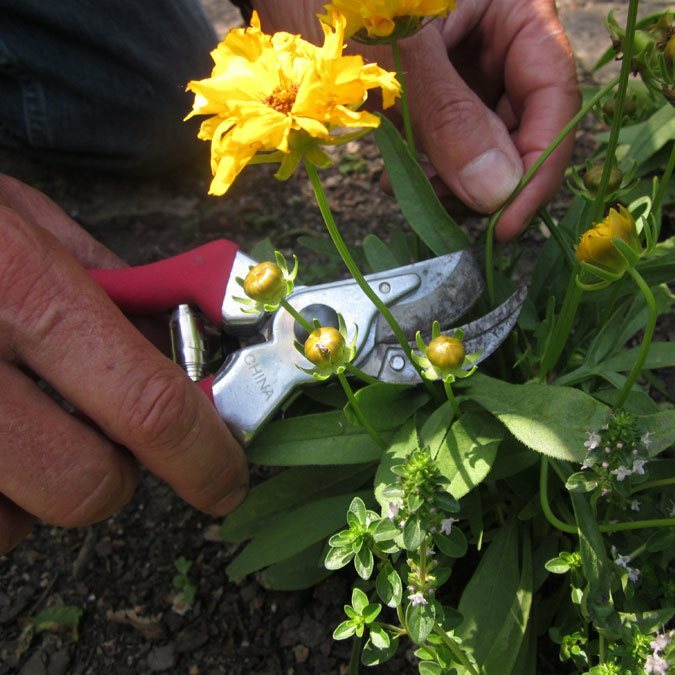 We call the process of removing spent flowers, dead-heading. A few of the perennials that will re-bloom after dead-heading are Daisies, Delphinium, Coral Bells, Salvia, Nepeta and some Daylilies. Other perennial flowering plants will look much better if the spent flowers are cut back to an intersection within the main body of the plant. Don't just snip off the spent flower or you will have empty stems. Some of the perennials that will not re-bloom but benefit from dead-heading are Peonies, Siberian Forget-me-nots, Iris, and many Daylilies. Flowering shrubs that bloom in the spring include Lilacs, Fragrant Viburnums, and Rhododendrons are best pruned up to two weeks after they finish blooming but no later. If you haven’t pruned them yet, it should still be okay through about June 15th (flowers were a bit later this year). They set their flower buds for next spring during this summer’s growing season so any pruning done in the summer or fall will affect next year's blooms. Annuals keep blooming most of the season and many do not need anything but consistent water and a bit of fertilizer. There are some that will benefit from a little maintenance. Petunias will bloom more if the spent flowers as well as the seed pods are removed down to the intersection. You can also cut Lantana seed pods off at the intersections. Geranium flowering stems can be snapped off where you see a bulge at the intersection. Other annuals that bloom better when dead-headed include Marigolds and Cosmos. Speaking of water, be sure to water slowly and deeply so that it soaks deep into the soil as soon as it dries out to encourages lush growth. But remember, some plants prefer it dry so in that case, less is best. You can over-water by not letting the soil dry out under the surface between watering so always check the soil before watering. A little mulch will keep the weeds down and the moisture levels more constant but be sure not to bury the bases of plants in mulch. Here at The Growing Place, we have years of gardening experience and we are always happy to answer your specific questions. Come on over for a visit! We're here to help.